Wow, look at that! It's been a year since the Celtic Lenormand first posted as part of the Tarot Blog Hop. Last Yule, the cards for this deck weren't finished, and I shared a spread that will be in the companion book. This year, I would like to share the finished card that represents this spoke on the Wheel of the Year in the pagan-themed Celtic Lenormand deck. Our wrangler, the Sun Goddess herself, Joanne, presented us with our theme: turning darkness into light. And that's an interesting one to consider in the light of the Moon, so to speak. The Moon travels around the earth and around the sun, and brings light to our nights by reflecting the sun's rays. And yet, it is still nighttime, despite the light. In the same way, Yule is still midwinter, the longest night, even if it does reflect the point after which days once again start to get that little bit longer. So, it was the Moon card that I chose to represent Yule in the Celtic Lenormand. 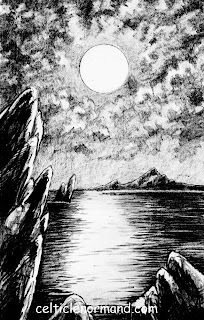 The black-and-white sketch is incredibly atmospheric, yet I still prefer the colour version. Interestingly, Will suggested that the dark of a moonlit night be painted in green, as he has in other decks. It's also a choice made by several artists from the Victorian era, heroes of his, such as John Atkinson Grimshaw. I adore the play of the light on the water in this image, and the way the rocks stand out, jagged and sharp. The clouds, too, are very atmospheric, and the moon itself is shadowed and textured. One meaning of the Moon in the Lenormand system is about reputation and fame, the way we are reflected in other people's eyes and minds. 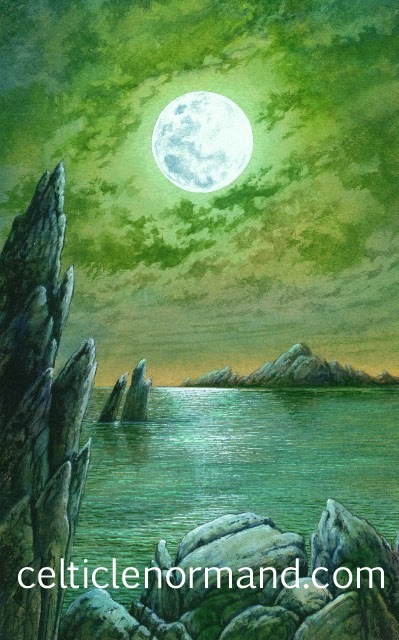 This can be seen as coming from the fact that the Moon reflects the sun's light, and is also why I put the reflection in the water in the Celtic Lenormand image. Another meaning is that of emotion, not necessarily just happy, loving emotions (more the realm of the Heart). Hence the deep waters and jagged rocks. Here's hoping you enjoy the Moon's light on this longest night: that it helps illuminate how others see you, and how you feel. Is there anything known yet about the publishing date? OOO! Beautiful card!!!! I get tingles! Yes, any idea on the publishing date? Ooooo very pretty! Looking forward to your deck being published! Wonderful... looking forward to holding these cards in my hand! Turn darkness into light by reflecting what light there is. That is what you, the writers of this blog hop are doing! Thank you. I am so looking forward to this deck! :D Excellent representation and happy yearversary!